This building was built in 1928. It is registered as Tangible cultural properties of Kyoto City. Café Indépendants was opened In 1998. An artist, Oyama Ikko and his fellows restored this basement floor to the original state and added a few new essences, in order to make up interior as a café. They have saved the wall paintings (those were likely to exfoliate, also soon) & precious antique tiles on wall, & etc.. This café name symbolizes open soul and free space like public square in city. We would like to provide the visitor with new encounter and, or, the collaboration opportunity of cultural creation. 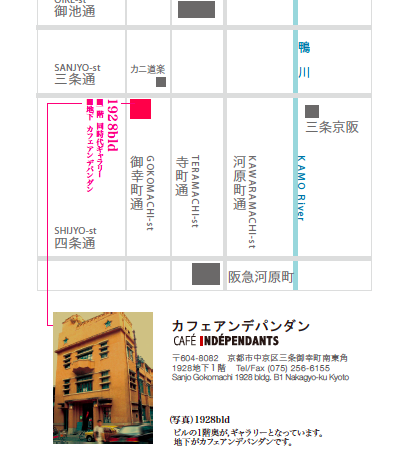 © 2004-2016 cafe-independants .All Rights Reserved.